Bitcoin prices continue to have a terrible time, crashing below $8,000 in splendid form this weekend. So much for bitcoin prices at $100,000. 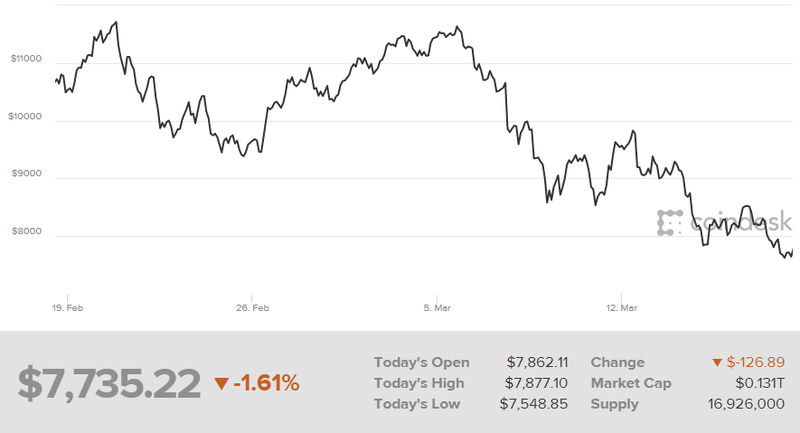 Bitcoin prices continued their disastrous run over the weekend, breaking below the psychologically important $8,000 level on Saturday evening. The crypto's price has shed about 25% so far in March. It's now down roughly 60% from the all-time high of more than $19,000 hit in Dec. 2017. At this point, negative headlines on bitcoin such as the likelihood of regulation will probably keep the crypto's price under wraps near-term. This week, analysts at Fundstrat outlined how bitcoin could possibly fall below $6,000. The call was notable in that Fundstrat has been one of the biggest hype machines on Wall Street when it comes to bitcoin. Fundstrat's founder Tom Lee entered 2018 calling for bitcoin prices to reach $25,000 by year end. By 2022, Lee was looking for bitcoin prices at $125,000. "It has been a challenging few weeks for bitcoin as the combination of negative headlines coupled with weak prices have added to further worsening of investor sentiment," said Fundstrat. "And when sentiment is this weak, the market is increasingly 'fire, ready, aim' -- meaning, any headline today is likely to trigger selling." Ripple prices haven't fared too well either of late. The crypto's market cap has plunged about 47% to $23 billion during the last month, according to coinmarketcap.com. But unlike bitcoin, ripple has made more tangible progress entering the real world as a payments platform. That is a key consideration as investors mull over which crypto to buy on weakness, if so inclined. TheStreet talked recently with ripple co-founder Danny Aranda. Watch below.